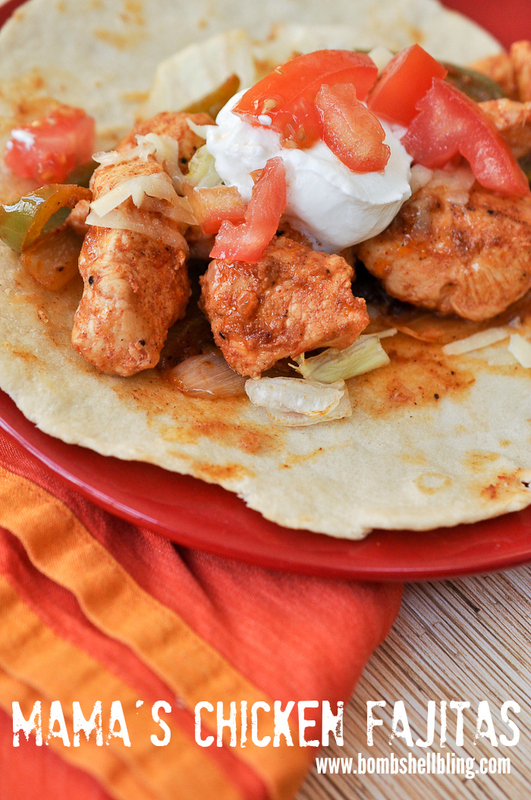 Growing up one of my favorite dinners was always my mom’s chicken fajitas. Mmmmmmm…… My mom didn’t enjoy cooking, so she didn’t have much of a repetoire, but when she made something she made it well, and her chicken fajitas recipe is one of her best. Today I am going to share it with you! 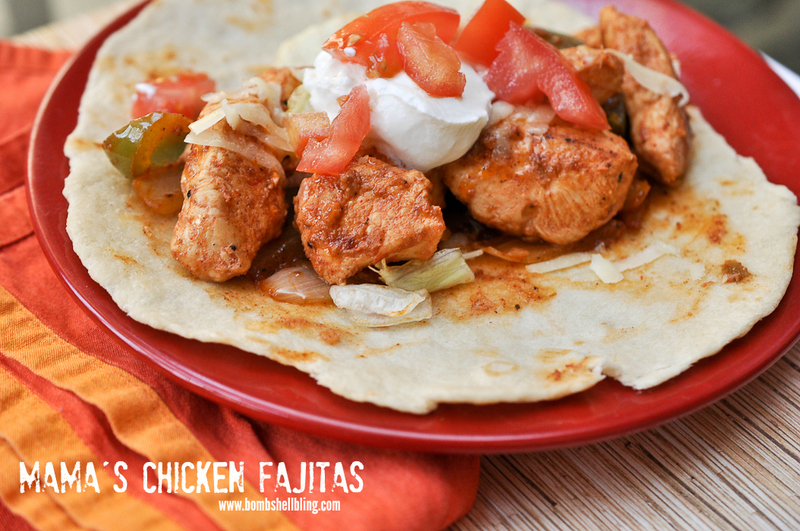 This chicken fajitas recipe is a simple marinade that you can use on either meat or vegetables. I have only tried making this recipe with chicken, but I bet it would work on other meats as well. Usually I also marinate green peppers and onions with this marinade as well. When you cook up your chicken or vegetables you will want to sautee them in a hot skillet that has some cooking oil in it. When they are almost cooked through toss some lime juice and tabasco over the whole skillet of food to zest up the flavor. I like to serve them with the uncooked tortillas you can find at Walmart or Costco in the refrigerated aisle. Yummmmmmmm. Here a Sally Westover (my mom) tip for you: cut up your chicken while it is still partially frozen. It is SOOO much easier to cut because it’s not rubbery and wet and wiggling all over! You are welcome. 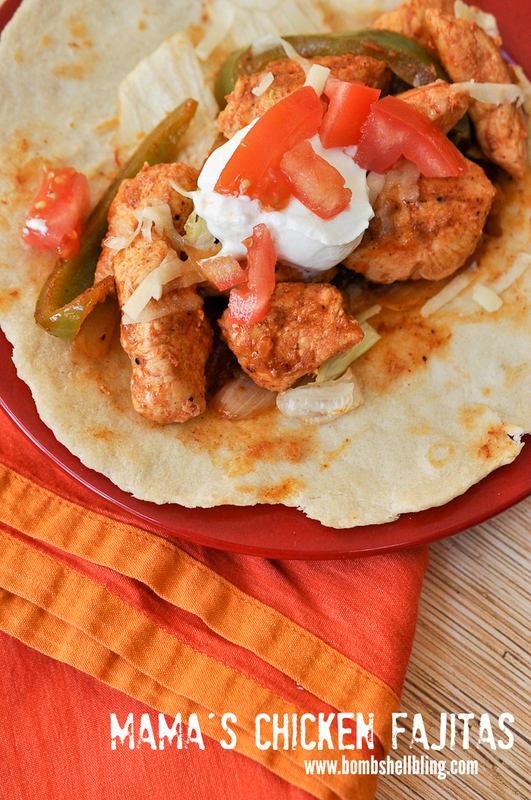 One more thing that I love about this chicken fajitas recipe is that you can just cook part of the meat one day and then the next day you can cook the rest. “Leftovers” but still super duper fresh and not reheated or dried out. Another technique learned from my mom. Now, without further ado, here is my mama’s chicken fajitas recipe. Mix together the garlic powder, salt, pepper, chili powder, and salsa to make your marinade. Chop up your chicken (partially frozen is simpler to cut) or veggies and throw them into the bowl with the marinade. Stir and refrigerate at least three hours or overnight. Heat cooking oil over medium high heat in a skillet. Sautee the chicken, flipping often, until almost cooked through. Toss lime juice and tabasco over the chicken to taste. Oh this looks absolutely delicious! I made fajitas last night and am just loving them!! Thanks for linking up to The Creative Exchange linky party! I want them both – the chicken and the pork! Thanks for sharing your great recipes at the What’s for Dinner party. Delicious Fajitas! Thanks so much for sharing your awesome post with us at Full Plate Thursday and hope to see you again real soon! I love fajitas, but have never found a marinade that’s quite to my taste. This recipe looks easy to follow and sounds delicious! This recipe is Featured at the Merry Monday party this week! Pinned and will be sharing on FB too. See you at this weeks party going on now!